I'm working on a quilt for a friend, who is pretty special to both my husband and to me. He was my husband's youth choir director throughout high school, and then moved (across the state) to my church and was my youth choir director in the following years. During that time, he encouraged each of us to pursue music in college, and as it happened, my husband and I ended up attending the same college (a tiny, private school in Shreveport, LA- I later transferred to LSU). It happened to be Sidney's alma mater. Of course, this is where we met. Fast forward almost three years, and Sidney ended up marrying us. Now, let's be clear about something. There is a huge difference between selling your quilts and taking orders for quilts- and it has nothing to do with your quilting skills. It has everything to do with second guessing your choices, and hoping that the person who has placed the order will like it. Although this is a huge departure from the kinds of quilts I usually make, I think that I captured the essence of the pictures and the soothing feel he wanted in the colors. I still worry that the creams and taupes blend together too much, but it does look a bit like sea glass scattered out on the beach. What do you think? I think it's very soothing and comforting design. Just enough contrast in the neutrals with the hints of aqua scattered throughout. I'm sure he'll love it. I think it's lovely and manly at the same time. Great pattern choice as well. I think you captured the palette from your inspiration photo - I agree with the others comments that think he'll love it. Gorgeous! I don't think your colours blend too much at all and it does look like a beach with sea glass scattered around. Fabulous job. I love, the colors look perfect...so calm and relaxing!! Great job! Those pops of light aqua make this quilt really sing, great work. this is a great interpretation of your inspiration Pic. 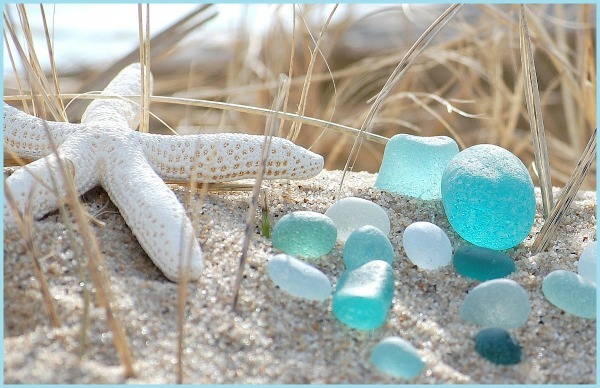 The scattered aqua bits do a great job of suggesting sea glass. Nice job! Oh Kelly it's just gorgeous!! Definitely calm and relaxing, i'm sure he will love it! Well I have to agree with all of the comments so far! Perfect balance of light sandy prints and bits of blue. And I really love your choice of pattern. Can you make a tutorial? It looks big, is it a queen size? Looks terrific! I think there is just the right amount of aqua. Thanks for sharing it with us. Very pretty! I think you nailed the feelings of the beach. You have enough good contrast among your creams and tans. Make sure you post a pix when completed. Thanks for your inspirations. I was thinking "you nailed it" then I saw Ellen beat me too it.. but you really did. Its cool that you thought of a picture to figure out the color scheme too. Great inspiration and I bet your friend will love it. The color combination is perfect and it gives you that relaxing feeling! I always talks about blue and brown and how nice I think they goes together, but this is so much better,like icing on the cake!